Set Sync Schedule for iSIC Real Time Clock to PC Clock - NexSens Technology Inc. The Sync RTC Schedule is the interval in iChart that will automatically sync the iSIC clock with the PC clock. As with any embedded device, the iSIC clock can drift as much as two minutes per month. Especially where power scheduling is implemented, making sure the iSIC time and the PC time are the same is important. Set a Sync RTC Schedule by clicking the Schedule button on the main instrument control screen. The Setup Device window will appear. 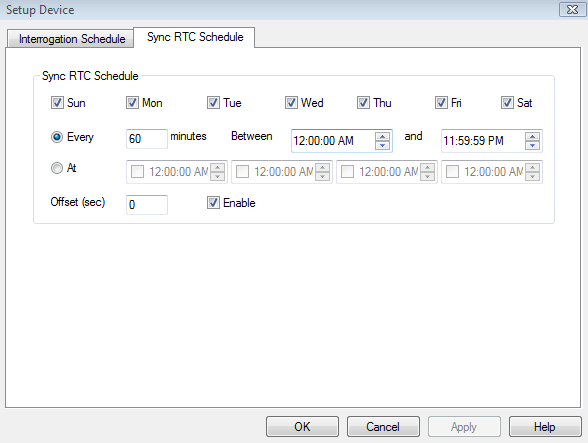 Select the Sync RTC Schedule tab and make sure Enable is checked. The recommended sync schedule is once per week. By setting a Sync RTC Schedule, users make sure the iSIC clock stays accurate to the PC clock. After the days and times have been entered, click OK to set the sync schedule.